Help you understand how your spine works and what can go wrong with it. Help you understand and gain access to the most effective treatment or treatments for your back problem. This information is meant to complement care you are currently receiving from your physiotherapist or other health care practitioner, and should not be taken as a replacement for seeking appropriate advice and care from a healthcare professional. 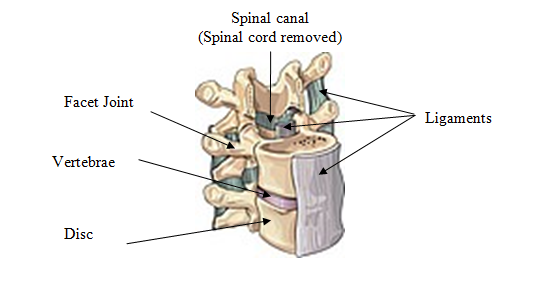 Note: For convenience, the term back will be used to refer to any/all parts of the spine. You are not alone. Back problems are very common. Up to 80% of the population will, at some point in their life, experience significant back and/or neck pain. At any given time between 20% and 50% of the population will be experiencing some type of back pain. Most do not find that the pain, while troublesome, does not significantly interfere with their normal activities of daily living (ADL’s). However, approximately 10-12% will experience back problems that are disabling in nature. Their spine pain is severe enough that it interferes with their normal ADL’s. To put this in perspective, Bridge Physiotherapy and Massage is located in the city of Nanaimo, British Columbia, which has a population of approximately 90,000 people. In Nanaimo, we can reasonably assume disabling back problems are affecting approximately 9,000 people at any given time. What Can You Do About Your Back Problem? The fact that these problems affect so many people is somewhat of a mixed blessing. On the positive side, there has been a significant amount of attention from the healthcare and scientific community focused on this problem over the past several years. This has given us a significant amount of information towards understanding and managing back problems. Unfortunately, there is so much information out there it is difficult to know what to believe. We feel that your best bet to coping with your back or neck problem is to become your own Back Mechanic. With the advent of the Internet, people can easily access information on back problems, but is there too much information? The answer is “yes”, and not all of it is good. In this series of articles, we have tried to summarize the basic information you need to be an informed spine patient! The vertebral column, commonly called the backbone has three basic functions. It supports the head and extremities while permitting freedom of movement. It provides areas of attachment for muscles and ligaments. It also protects the spinal cord and nerves. In a healthy spine, there are 3 systems that work together to allow these functions to occur. Skeletal: The bones and joints make up the basic support unit. Soft tissues: The muscles, ligaments, discs, and tendons are the connective tissues that stabilize and allow movement of the bones and joints. Nervous system: The brain and spinal cord. Messages travel along the nerves in split seconds. Pain and discomfort are messages that something is wrong and corrective action is needed. Cervical Spine: This is the Neck and is located between the skull and the rib cage. It is composed of 7 vertebrae. They are numbered from top to bottom i.e. the first cervical vertebra is labelled C1 and the last is C7 (C1 to C7). It is the most flexible part of the spine. It supports skull. The slight forward curve is called a lordosis. Thoracic Spine: This is the part of the spine that the rib cage connects on to. It is composed of 12 vertebrae (T1 to T12). The backwards curve is called a kyphosis. 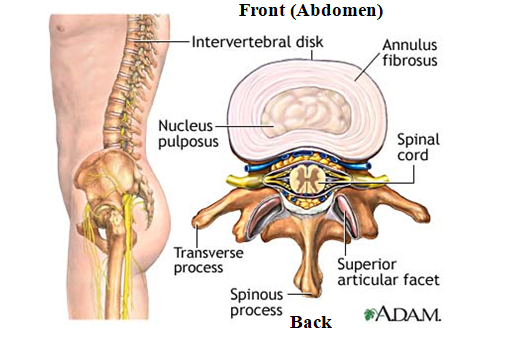 Lumbar Spine: This is the low back and is located between the rib cage and the pelvis. It is composed of 5 vertebrae (L1 to L5). Sacrum: This is the part of the spine that joins onto the pelvis. It is composed of 5 vertebrae (S1 to S5). These 5 vertebrae typically fuse together as we grow to form one, the triangular-shaped bone at the base of our spine called the sacrum. Coccyx: This is a rudimentary, triangular-shaped bone joined onto the bottom of the sacrum, commonly referred to as the “tailbone”. The primary building block of the skeleton is the vertebral body. It is the largest portion of the vertebra and is responsible for weight bearing. Projecting behind the vertebra is a series of bony projection called pedicles, lamina, transverse, and spinous processes. The spinous process is the hard bony point you can feel below the skin when you run your hand across your back. These processes serve as points of attachment for muscles. Between the transverse processes are the facet joints. They are found on either side of the vertebra and interlock with the facet joints above and below. These joints determine the direction of movement between two vertebras. Their structure is similar to other joints in the body. They are covered in cartilage and are encased in an elastic capsule that contains fluid. They are about the size of the finger joint. In the neutral position, the joints support about 25 % of the load on the spine. When we bend forward there is less loading. When we bend backwards the opposite occurs. Lying between the vertebras are the discs. They act as spacers between the vertebras and are firmly attached from above and below holding the vertebra strongly together. They also act as shock absorbers. They permit movement, vertebra are just big blocks of bone and on their own would have no movement. The basic functional unit of the spine is called a motion segment. This is comprised of two vertebras with the disc between them. The disc is composed of two parts; 1) the annulus, which is the outer shell and surrounds the nucleus with strong crisscrossing fibres, 2) the nucleus, which is the centre of the disc and is composed of a jelly-like substance. It is about 85% water in a young healthy disc. With age it water content decreases and it loses some of its ability to function as a shock absorber. Note: the term slipped disc is incorrect. Discs cannot slip; instead, the jelly-like material can bulge or protrude from between the vertebra creating the impression the disc has moved. Protruding discs can place pressure on the nerves. The following diagram shows three vertebrae stacked on top of one another. The top vertebrae has had the front of it removed (the “vertebral body”) to show you the spinal canal, which is the bony tunnel that all the nerves travel through. Ligaments are designed to prevent excessive or abnormal movement from occurring between vertebras. They connect and stabilize vertebra as one continuous structure. They are tough elastic fibres that are found in front, behind, at the side, and between vertebras. The muscles provide movement and stabilization with voluntary control. Without their support the spine is unstable. Muscles are attached to bone by tendons. The main function of the back muscles is in keeping the vertebra aligned and balanced. They are not designed for heavy lifting. They are sometimes referred to as prime movers and core stabilizers. The prime movers are the muscles that are responsible for the forward and backward movements in the spine (as well as rotation and side bending at some levels). The stabilizers are the muscles that maintain your spine in the neutral position. We will review these muscles in more detail in the core stability session. The spinal cord is the connection between the central processor (brain) and the sensors (nerves). The spinal cord ends at the level of the first lumbar vertebra. The spinal cord and nerves send sensory information to the brain from the extremities. The brain reacts by sending messages down the spinal cord and nerves to tell the muscles what to do. There are approximately 31 nerves branch from the spinal cord and travel throughout the body. In the neck, a group of nerves combine to form the brachial plexus. These nerves control your arm function. In the low back, the sciatic and femoral nerves control leg function. The spinal cord along with the brain forms the CNS. The nerves form the peripheral nervous system. The following diagram is a view from above as we look down on the spine. This shows how the spinal cord travels through the spinal canal as well as the relationship of the disc to the spinal cord. What to do next? How do you solve the problem if you are suffering from spine-related pain today? Call Bridge Physiotherapy and Massage at 250-585-8480 or e-mail us. Serving Nanaimo, Lantzville, Nanoose Bay, Parksville, Gabriola Island, Ladysmith.